Garden of Eden becomes Cannes 2017 Creative Minds Short Film Corner recipient. Shortly after they’d concluded their second and final sold out screening of their short film, Garden of Eden, it was chosen for the 2017 Creative Minds Short Film Corner program at the Cannes Film Festival. A coming of age story about the struggles of coming to terms with being black, queer and female in New York City. We are back with EPISODE 8 and very honored to bring you a discussion about healing from self-proclaimed "Love Activist" Anyanwu (@anywanwu3). We got a chance to hear from this Actress, Social Justice Educator, Doula and Herbalist about surviving gun violence and how that enhanced the trajectory of her purpose. She openly shares her knowledge about harnessing vulnerability, surrendering to the journey and grounding it all in love. You needed a word...she brought them, don't miss it. OkayAfrica has teamed up with Okayplayer and bklyn boihood for a night of film, performances, and dialogue centered on Garden of Eden— a film by Imani Dennison and Robin Williams, about 17-year-old Jaliyah (Anyanwu Uwa), a recently outed lesbian coming to terms with her sexuality while trying to deal with her father’s disapproval and navigating homelessness in New York City. The event will be hosted by Vanessa Newman with DJ Adair on the turntables. 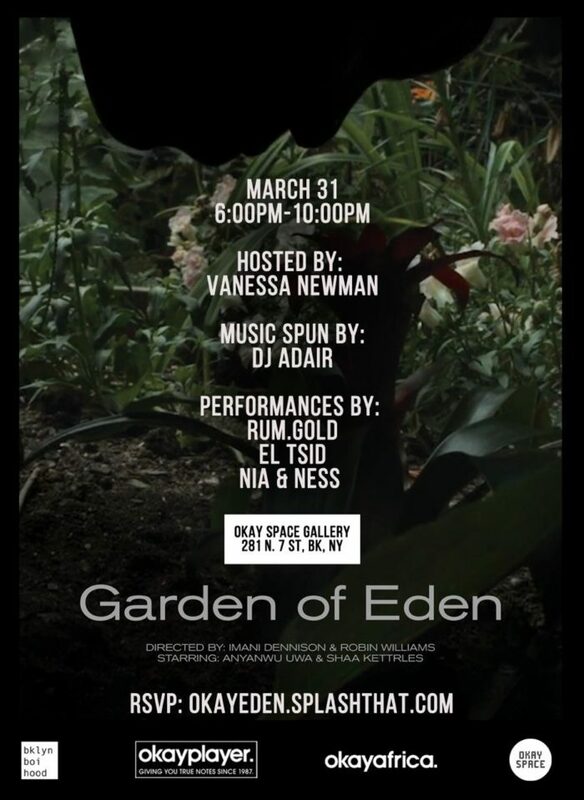 There will be live performances by Rum.Gold, EL TSID, and Nia & Ness. Afterwards, Okayplayer contributor, Myles E. Johnson will chop it up with the team behind the film. It’s going down Friday, March 31 at Okay Space from 6:00 to 10:00 pm. Even though Malika (Anyanwu) was born female, she only felt she was herself until she became Messiah (Tanisha Thompson) a DJ and aspiring rapper who happens to be male. Now Malika has to face a world that rejects Messiah, but soon will discover that one of Messiah’s biggest enemies is probably himself. 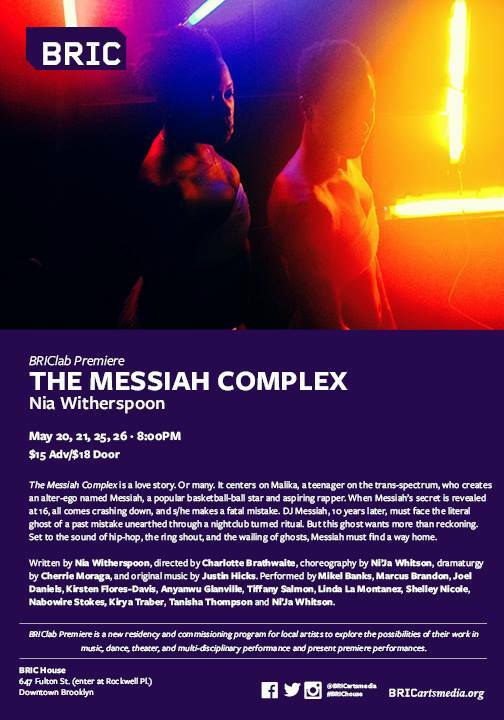 The story at the center of Nia Witherspoon’s The Messiah Complex is one that hasn’t really been told in the theatre (or any other medium for that matter), it’s a story of self-discovery that seeks to reclaim what one of the characters refers to as “stolen black bodies”. It’s refreshing to see a play that’s both emotionally involving and politically charged, as Witherspoon aims to find links between a black generation brought up on the Black Panthers, and one in which one’s soul is not doomed to remain forever trapped in a body that doesn’t quite fit. In response to tremendous demand for The Messiah Complex, BRIC is pleased to announce an additional performance on Friday, May 27 at 8pm. On Wednesday, May 25, the performance will be followed by an artist-audience dialogue moderated by Darnell Moore. Moore is Senior Editor at Mic, co-managing editor of The Feminist Wire and Writer-in-Residence at the Center on African American Religion, Sexual Politics and Social Justice at Columbia University. The Messiah Complex, written by Nia Witherspoon, is a non-linear story that centers on Malika (played with captivating emotion by Anyanwu Uwa and Tanisha Thompson), whose parents were Black Panthers, a teenager on the trans-spectrum who grows into an alter-ego named Messiah. BRIC is pleased to present the world premiere of THE MESSIAH COMPLEX, a new play written by Nia Witherspoon and visionary director Charlotte Brathwaite with choreography by Ni'Ja Whitson and dramaturgy by Cherríe Moraga. Featuring a predominately black, queer and trans cast and creative team, THE MESSIAH COMPLEX is a play about the legacy of the Panthers in the age of crack, where a scratch at a DJ booth incites a replay of the past, an action that interrogates generations of violence on black, queer bodies. 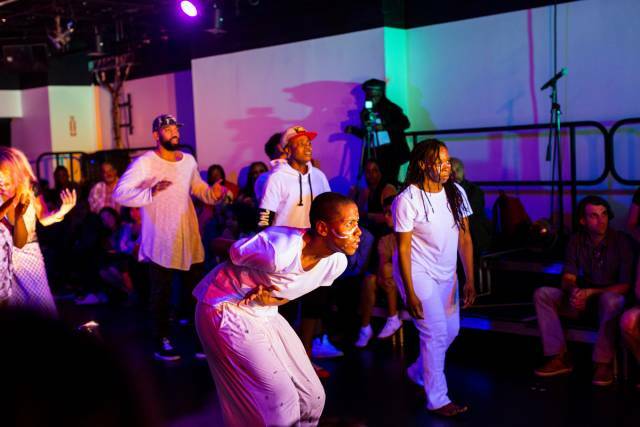 This BRIClab Commission brings ritual into the theater, shifting from the secular to the sacred through rites already present in black life-the frenzy of a nightclub, the libations poured on street corners, and the sonic landscapes of hip hop. Ultimately, THE MESSIAH COMPLEX tells a story of recognition, revolution and forgiveness.